Here’s an interview with the author of, Nancy Clark’s Sports Nutrition Guidebook, discussing hydration and food advice and is with the permission of Human Kinetics. Base training starts soon if it hasn’t already which brings on longer bouts of exercise. The longer you go, you more you need to know how your body’s chemical reactions are happening. This excerpt from Vegetarian Sports Nutrition is reprinted with permission by Human Kinetics. for fluid replacement and then have a beer for social fun. by food manufacturers in processing (as listed on the food label). 12 grams of salt (3.9 to 4.7 g of sodium) per day. excessive sodium and other electrolytes during prolonged sweating. significantly lower in the athletes with muscle cramps. relieved with more liberal use of the salt shaker. also disturb electrical impulses and induce cardiac arrhythmia. of defense in preventing muscle cramps. If only it were that simple. milligrams per day for adults. parathyroid hormone and vitamin D.
discussed later) are prone to muscle cramping. 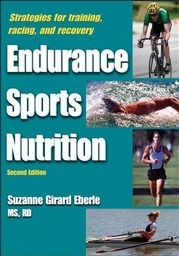 Some practical wisdom on endurance sports nutrition from the book is “Endurance Sports Nutrition“, reprinted with permission by Human Kinetics. intended race pace or intensity. for you are the ones that go down and stay down. able to continue and finish, albeit not with the desired performance. athletes) to stay in energy balance. reconstitute it along the way.